One aspect of the market over the past two plus years has been the outperformance of large cap stocks relative to their small cap counterparts. The below table compares the performance of the iShares Russell 2000 Small Cap Index (IWM) to the S&P 500 Index, both on a calendar year and annualized basis. 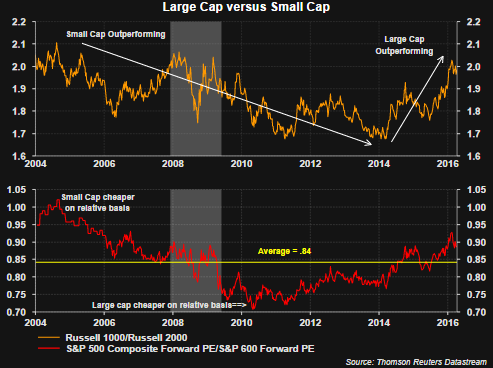 The magnitude of the weakness in the Russell 2000 Index performance shows small caps are underperforming large cap as far out as 10-years on an annualized basis. Our clients know we exited the small cap space at the end of 2013 primarily on a concern with the valuation of small cap stocks overall. The red line in the bottom portion of the below chart displays the relative P/E of the S&P 500 Index to the S&P Small Cap 600 Index. At the beginning of 2010 the relative P/E relationship indicated large cap stocks were cheaper on a historical basis. Now that large cap stocks have outperformed since the beginning of 2014 through April 8. 2016, large caps are beginning to look more expensive on a relative basis and trade at a relative valuation level present at the beginning of the 2008/2009 recession and above the average (yellow line) going back to 2004. Valuation alone is not necessarily a cause for a stock or index to underperform. In some instances strong earnings growth can be supportive of a higher valuation; hence, the 'growth' category across different equity asset classes. This week begins the official start of first quarter earnings season with Alcoa (AA) reporting after the market close today. Indications are we may be nearing a bottom in earnings weakness. Certainly the headwind from currency should lessen significantly on a year over year basis. Additionally, oil prices have seen some stability and earnings weakness attributable to oil should begin to lessen as well. As the below table shows, operating EPS comparisons on a YOY basis (first red rectangle) are expected to see growth. Significant growth is expected in the small cap space with YOY growth of 45%. For all of 2016 small cap operating earnings are expected to grow 76% over 2015 versus 17% for the large cap S&P 500 Index. This growth in earnings brings the estimated 2016 small cap P/E down to 19x and nearly in line with the 17x P/E of the S&P 500 Index as can be seen below. The market has enjoyed a strong recovery from the February 11th lows with the Russell 2000 small cap index up over 17% until the slight 2% pullback last week. It would not surprise us if a little more consolidation of these recent gains occurred near term. However, given the potential for strong earnings growth within small caps and their more reasonable valuation versus a few years ago, small caps are beginning to look more attractive and may be worth a harder look on a pullback.